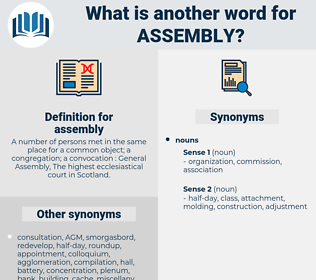 What is another word for assembly? A number of persons met in the same place for a common object; a congregation; a convocation : General Assembly, The highest ecclesiastical court in Scotland. house, parliament, parliaments, chamber, legislature. parliamentarians, matters, assignments, Recalls, Cameras, Languages, lessons, Accessories, components, articles, auditors, commitments, remarks, colleagues, supports, documents, Rights, benefits, contributions, objectives, Facilities, heads, results, Has, victims, topics, invites, Forms, Records, objects, women, asssembly, asamblea. elected, gathered, concerned, appointed, held, agreed, received, made. dispersion, retirement, dismantlement, seclusion, loneliness, solitude, privacy. First we square the matter of Bedford and the Assembly. chapter, States General, tribunal, deliberative assembly, coven, Witches' Sabbath, council, sabbat, bench, legislature, Areopagus, legislative assembly, legislative body, law-makers, general assembly, judicature, chamber, court.